SpeechExec Pro dictation and speech recognition software links authors and typists, facilitating communication, the setup of individual workflow settings and organizational flexibility. Both sides can work more efficiently and get more done in less time. The solution includes an integrated version of Nuance Professional speech recognition software, for extremely accurate results. The software automatically routes your dictations to your desired transcription option, including SpeechLive. 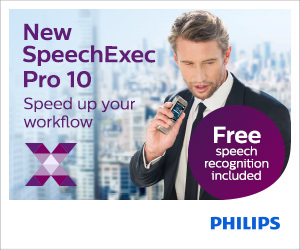 SpeechExec Pro is the perfect companion to the SpeechMike Premium dictation microphone. This entry was posted in Product News and tagged automatic routing, documents, encryption, integrated, secure, speech recognition, SpeechExec. Bookmark the permalink.